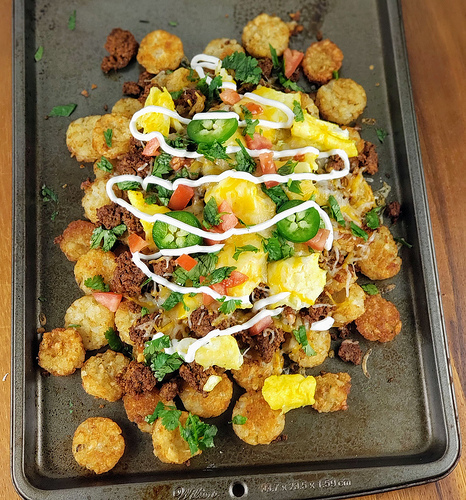 These breakfast totchos are loaded with chorizo sausage, scrambled eggs, cheese, cilantro, tomato, jalapeno pepper and sour cream. This recipe makes a great appetizer for parties or to serve for game day. You can buy the chorizo from the store but I prefer to make my own. It is so much better and less spicy. The tater tots are baked in the oven and then loaded with the toppings and returned to the oven to melt the cheese. Enjoy. In a small bowl combine salt, pepper cayenne, paprika, cumin, and garlic powder. Stir until well combined. Toss the frozen tater tots in the spice mixture. Place onto a baking sheet and cook according to package directions.